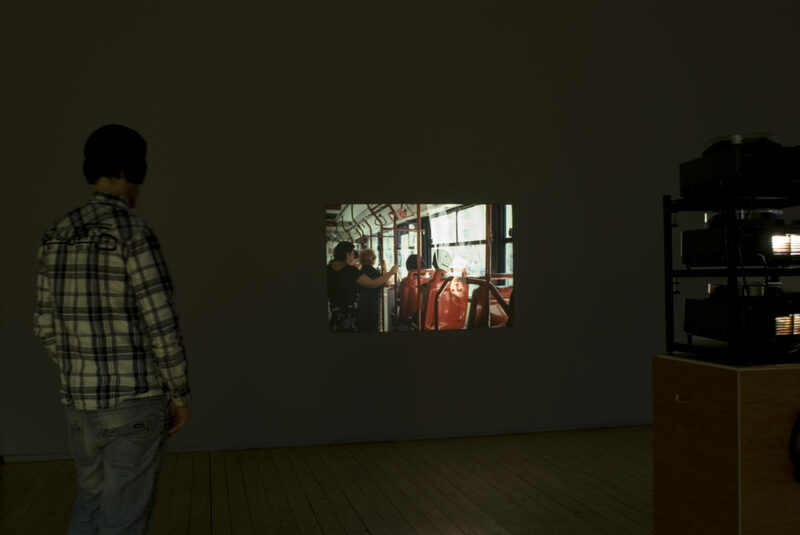 Medium (Upsidedown) consists of a slide projection with audio, its subject a fictional character created by a novelist residing in Rome. One of the sources for this character was the protagonist from McCrea’s recent slide projection works, played by his daughter. McCrea travelled to Rome to speak with the author in the hope that this transposition of form could have resonance within his work, only to find that the novel had been rewritten, the latest draft existed only in fragments. Any recognisable traces of McCrea’s protagonist in the new text had gone. In a sequence of projected images the separation of figure from background by means of dissolves, superimpositions and the orientation of the projections is set against the voice of the novelist. For the artist, the problematic of the voice and visual representation of the female subject by a male author is raised within the work and this in turn becomes the focus of Medium (Upsidedown). « Previous work: The Lost Photographs of Alfred H.